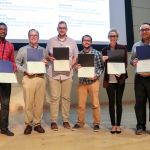 Graduate student Gavin Hester won a poster prize at the SNS/HFIR User Group Meeting at Oak Ridge National Laboratory in July 2017. Well done, Gavin! 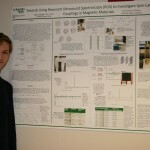 Undergraduate researcher Tyler Dodge has won prizes this year at two conferences (Front Range Advanced Magnetics Symposium 2016, and the APS Four Corners section meeting 2016) for his poster that described developing the Resonant Ultrasound Spectroscopy probe. Well done, Tyler! 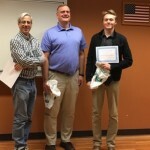 Undergraduate researcher Tim Reeder won a prize for an excellent oral presentation that he gave at the Magnetics workshop held at CSU in the fall of 2016. Well done, Tim!